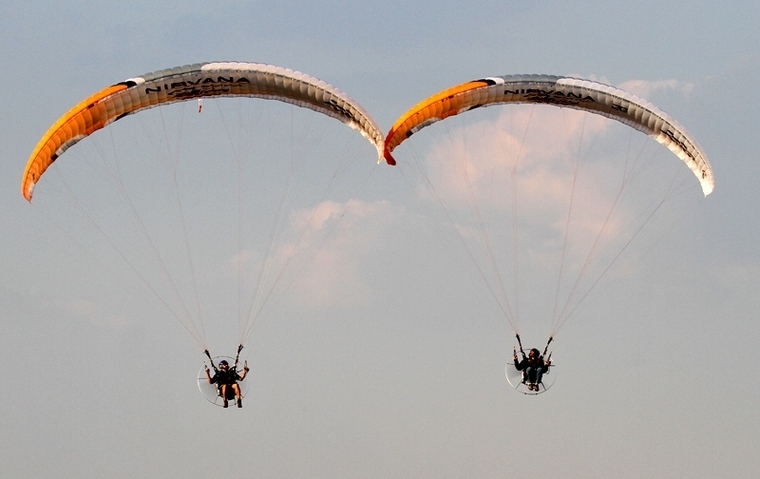 Powered Para-gliders or Para-motors are taking the recreational flying community by storm. Even high hour PPL and CPL pilots have found this a cost effective way to enjoy flying in a social setting. 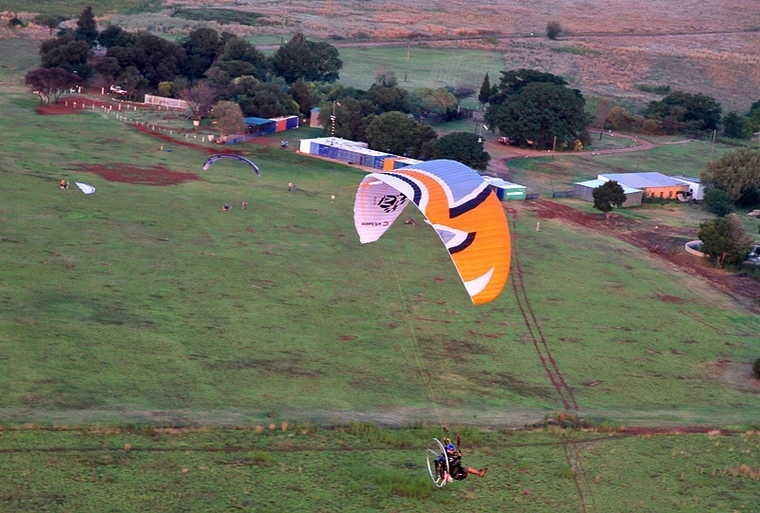 Anyone looking to start this exciting and affordable form of powered flight must visit Flying Unlimited in Centurion. Tony Gibson, Riaan Struwig and Ronnie Beukes run an excellent operation. They will supply all the equipment needed, train all students to the highest levels and are always at hand to offer advice. Between the three of them they have more than 30 years experience in flying Para-gliders and Para-motors. Tony started flying Para-gliders in 1997 and fell in love with this form of flight and he has been involved in this form of aviation for fifteen years. Para-gliding was the forerunner to the powered versions he flies today, although the wing is very similar the emphasis is on gaining lift to stay airborne for as long as possible. Tony who has won his first title in this form of the sport in 2005 has accumulated over 5400 hours on Para-gliders both powered and non-powered and has been South African Champion since 2007. Tony has achieved a 16th place in the World Champs and is also the current world record holder for the fastest measured 100 km flight in one direction then flying back to the original departure point. He managed an average of 77km/h. Riaan Struwig, an Electrical engineer by trade, fascination with aviation started when he joined the SAAF and was chosen to work on the Cheetah project. He was sent to Israel during the development of the onboard radar and weapons systems for the range of Cheetah fighter aircraft. 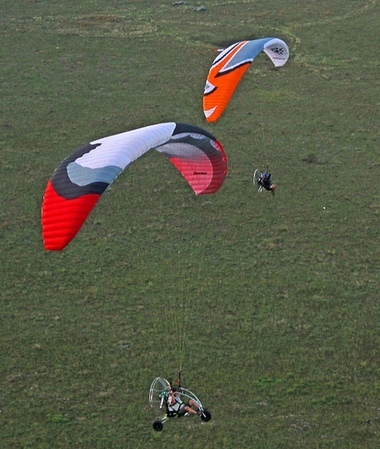 Riaan fell in love with PPG's (Powered Parachute Gliders) and decided to join Tony at Flying Unlimited. He brought a wealth of technical knowledge to the table and has been instrumental in designing the locally manufactured backpacks and trikes. Skywalk flight school merged with Flying Unlimited bringing Ronnie Beukes, a very experienced instructor to the team. Ronnie started flying Para-gliders in 1995 in the Volksrust area and also made the progression to Para-motors. 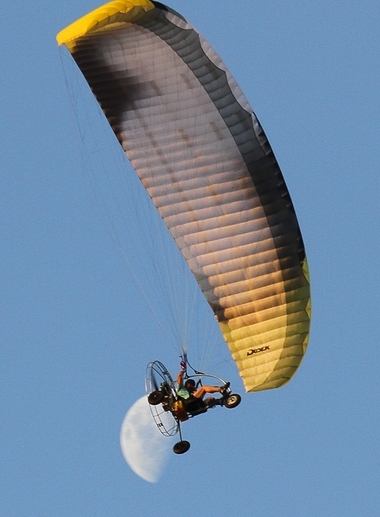 He still loves to fly Para-gliders as he believes it's the purest form of flight. 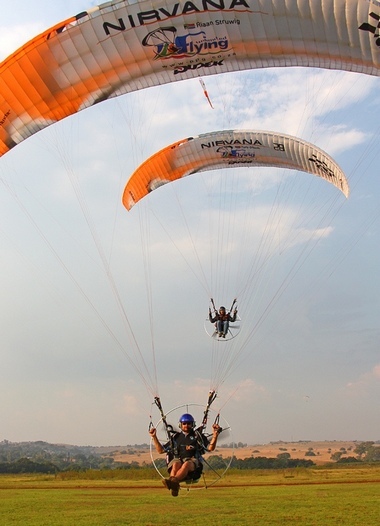 Ronnie, Tony and Riaan are top rated instructors and are all members of the South African PPG Display team. 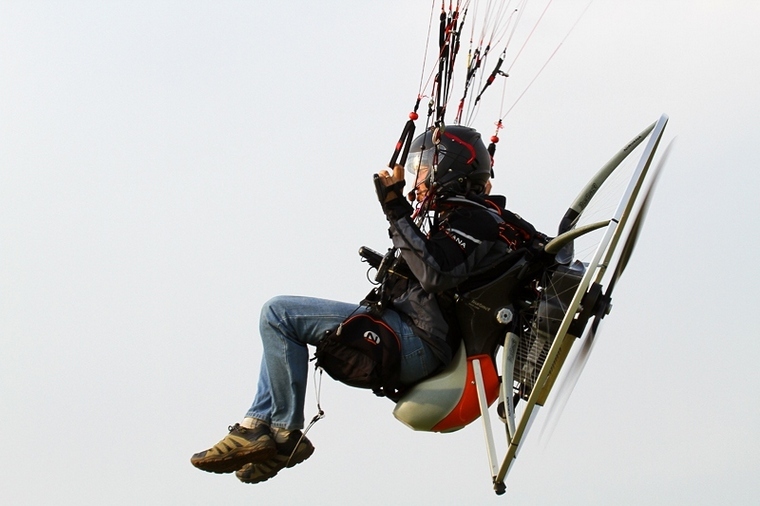 Powered Para-gliders are divided into two main categories, Backpacks and Trikes. Backpacks are the more cost effective of the two types. Basically an engine, fuel tank and propeller are strapped to ones back and after inflating the wing the pilot has to run a few steps to get airborne. Backpacks are very portable and can fit in most cars or bakkies , no trailers needed, portable flight at its very best. Trikes are not as portable but just as quick to get airborne. Trikes have a take-off run of more or less 20m in windless conditions and a lot less if there is a slight head wind. Two stroke motors ranging from 60cc to 230cc are used. These engines are extremely light on fuel. The largest Trike currently based at Flying Unlimited is the XCitor tandem that has a fuel burn of less than 12 liters of premixed Mogas per hour. 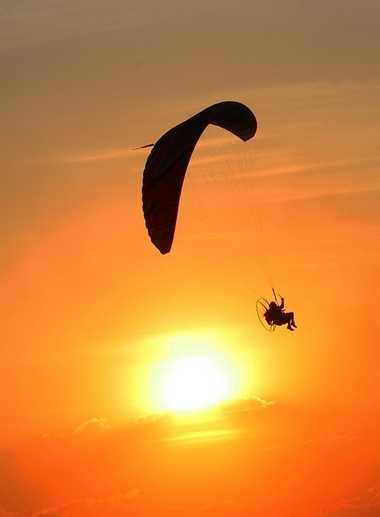 Getting started in the sport is way more affordable than any other form of powered flight. Packages ranging from a mere R50 000.00 are available. This includes everything needed to get you airborne including all your training and licence fees. Licensing is managed by RAASA (Recreational Aircraft Association of South Africa) and consists of ground training, a basic theory exam, per-solo test, a valid restricted air band radio licence and a flight test. A minimum of 35 flights are needed to obtain your licence, one minute of airborne time constitutes a successful flight. All pilots must be in possession of a valid Class 4 Aviation medical. The most challenging part of flying a PPG or Para-motor is the take-off. Once a student has learnt to control the wing on the ground it is relatively easy to control in the air. In the case of an engine failure the pilot will still be able to land safely. The wing does not need power to control and one can literally land anywhere as only a few meters of open ground is needed. 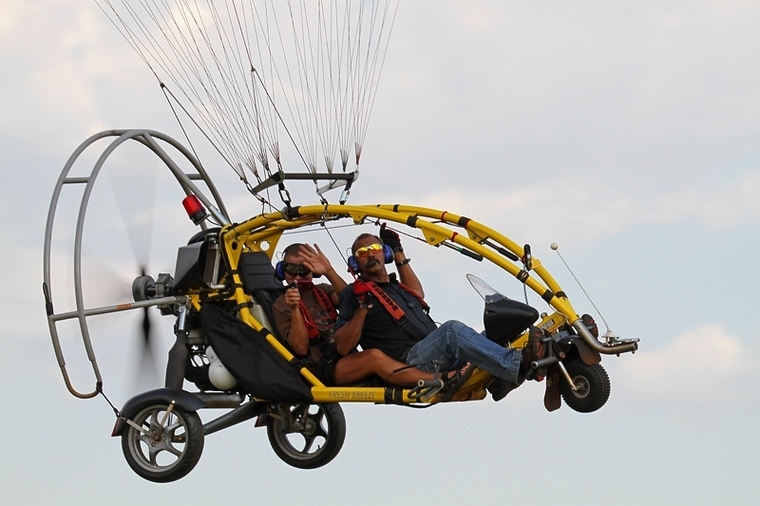 All backpacks and trikes are equipped with a reserve chute which can be deployed in the case of a canopy failure making this a very safe form of flying. Tony Gibson and Eugene Coussons the founder of Chimp Eden are in the advance planning stages of an attempt to set a new long distance record. Flying over 9, 000 km the record attempt will start from Johannesburg and take them to Botswana and then down to Namibia form where they will follow the cost all the way to Mozambique. The next leg of the attempt will take them to Lesotho and from there back to South Africa with the finish in Pretoria. During this flight they will attempt another record for the longest dessert crossing by a PPG, a daunting leg of 600km across the inhospitable Namib dessert. During the flight they will be filming documentaries' for Travel Planet, Kyknet, Animal Planet and EarthLife TV. During the flight funds will be raised for many Humanitarian and Wildlife Charities. Flying Unlimited are currently the agents for a host of international suppliers of such as Navarna, Fresh Breeze, Fly Products and Kobra motors, and wings by Dudek, Ozone , ITV, Apco, Skywalk, BGD and Airwave. A full range of accessories are also available from the team at Flying Unlimited. Visit www.ppg.co.za for more information on Flying Unlimited.